Large tub – 44 ounces. Premium ingredients in economical tub format. 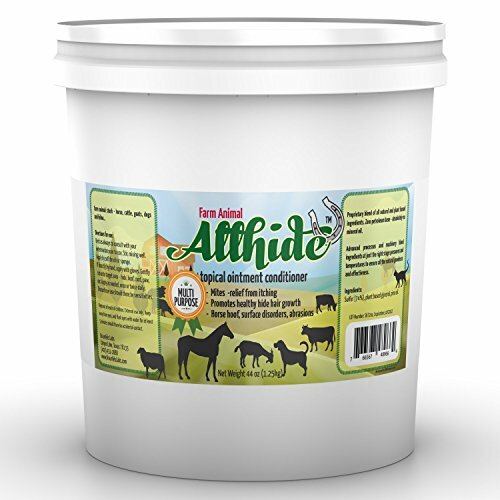 Trademark brand AllHide is a premium sulfur ointment conditioner for horses, cattle, goats, dogs and feline. Ideal farm animal salve that is all natural. Absolutely zero petroleum products – no mineral oil. All natural ingredients – 74% colloidal sulfur suspension, plant based glycerol, and pine oil. Brush on, or apply with gloved hands.44 oz large tub. Mange, Hot spots and abrasions – powerful all natural, hide sulfur conditioner.Trademark AllHide premium sulfur ointment conditioner for horses, cattle, goats, dogs and feline. Farm animal’s best friend. Multipurpose. Mites – relief from scratching. Abrasions. Horse hoof, ear, hide, coat hair. All natural. Absolutely zero petroleum base ingredients. No mineral oil ! 74% colloidal sulfur suspension. Manufactured by Braunfels Labs, using advanced proprietary processes and equipment. Distributed throughout the USA and worldwide.